Tobie and I had rather enjoyed the 2011 reboot movie, Rise of the Planet of the Apes. Despite it having James Franco in it, the movie was quite the powerful tale and it became one of the key examples of why Andy Serkis deserves an Oscar. But as fun as the movie had been and the way it had ended, I never really expected them to seriously consider a sequel. But here we are talking about that very movie. Dawn of the Planet of the Apes was positioned as a direct sequel to that same movie, which is a good thing since it shows we're all ignoring the strange 2001 remake by Tim Burton. Admittedly I didn't pay too much attention to the development of this movie. There are quite a number of movies that are dominating the media conversations and this one just sort of slipped by the radar. Thus without having seen too many trailers and reading potential spoilers about the plot, I was generally passive about wanting to watch the movie or not. But given the recent rotating power outages in the city after Typhoon Glenda, we found ourselves trying to beat the heat in a cinema. And it was totally worth it. 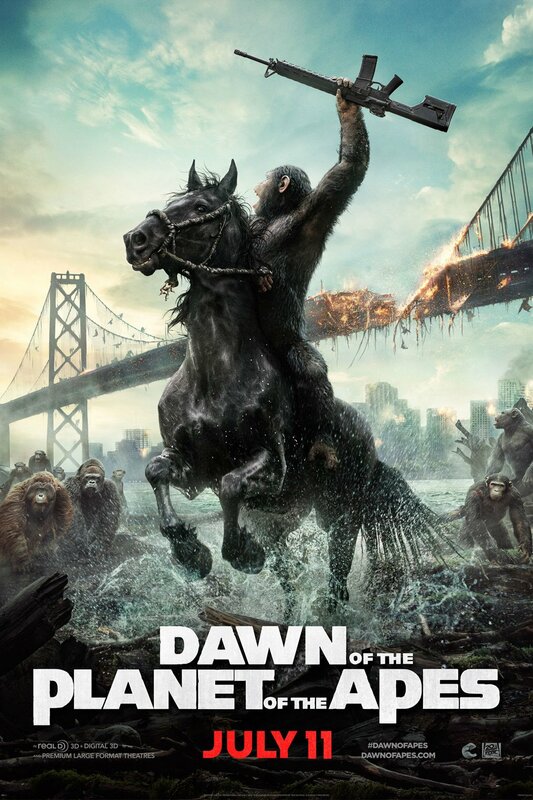 Synopsis: Dawn of the Planet of the Apes is a 2014 sequel to the 2011 reboot movie. This time around it was directed by Matt Reeves with a screenplay by Mark Bomback, Rick Jaffa, and Amanda Silver. It has been over 10 years since the events in Rise of the Planet of the Apes and the ALZ-113 virus has spread across the world, killing most of humanity. Meanwhile Caesar (Andy Serkis) and his apes have created a new home for themselves in the Muir Woods. Beyond creating homes and using tools, the apes have continued to develop their sign language as a means of communication and a code of conduct that boils down to the single commitment related to apes not taking the life of other apes. But things change when Caesar's son, Blue Eyes (Nick Thurston), and Rocket's (Terry Notary) son, Ash (Doc Shaw), encounter a human survivor in the woods. Carver (Kirk Acevedo), the human, shoots Ash out of panic and this eventually brings Caesar and the other apes just as the rest of the survivors gather around Carver. Caesar manages to keep the peace and orders them to go away without loss of life, but also orders Koba (Toby Kebbell) to follow the humans. Thus they discover that there's a small community of genetically immune human survivors still living in San Francisco. And their primary interest in the Woods is to gain access to the hydroelectric power plant and find a way to restore power to parts of the city. First off, we can't ignore the importance of CGI in a movie like this in order to bring the various ape characters to life. And I know that every year there's going to be that movie that really stands out in this regard, I will make the cliche statement about how the movie technology here was just amazing. The animation has really reached a point where the apes were just so amazingly lifelike, plus there's the emotional value provided by all the micro-expressions and other details that really added to the already great motion-capture performance by the cast. I doubt this movie alone will convince the Academy to at least get Serkis a nomination just yet, but one can hope, I suppose. Plus apes riding horses. If there is no other image that should jar anyone into the need to accept that these apes aren't at all typical, then this is the image that dispel all that. Again, we had apes of different kinds riding horses. It was cooler than I had initially expected. This is not to say that the supporting human cast didn't perform well either. Jason Clarke appears to be doing rather well for himself since I last remember seeing him in Zero Dark Thirty. Among the human characters, he certainly had the most prominent role and had a lot to account for in this movie. And he delivered quite admirably, for the most part and I sincerely enjoyed him in this movie. You can't really go wrong with Gary Oldman for that matter, and in this movie he was pretty much his same character in the Batman movies. That leads us to where the movie really shines - the story. As much as the first movie in this particular iteration of the franchise was decently fun, this movie really took things to a whole different level. And while there was still some lingering fanboy fun factor to be had in determining the parallels between this movie and the older ones that had come before, things also had a more serious tone that still felt wholly appropriate to the overall atmosphere of the movie. And major credit to the director for managing to sell us on a story that was primarily focused around the ape's new society more than anything else. This involved a fair amount of subtitles and the odd verbalization here and there, but those factors in now way too anything away from the emotional message of the film. The movie has a lot going for it - a good amount of action, a fair amount of drama, some well-written dialog and all the other good stuff. The story had the right balance of complexity that kept things interesting and fresh without becoming too much of a headache for younger audiences and such. Dawn of the Planet of the Apes is a great continuation of this reboot franchise and in many ways better than the movie that had preceded it. It was more than worth catching it on the big screen, although probably different reasons than you think. Thus it gets a full 5 community problems among the apes out of a possible 5.